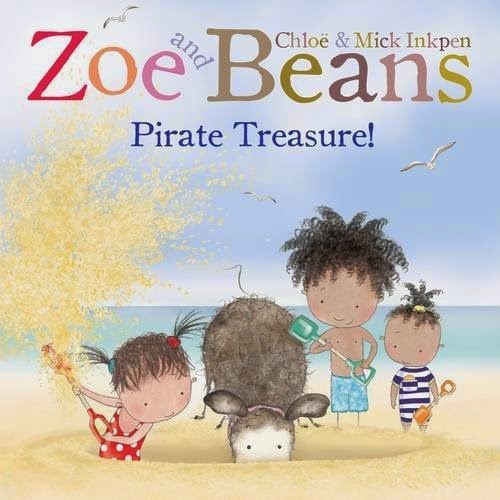 Children's Book Review :: Zoe and Beans Pirate Treasure! I shall admit that we were actually waiting with anticipation for the next of wonderful children's books in the Zoe and Beans series to be published. Ever since we first discovered Zoe and her funny dog Beans (in the days before Holly was even born) we have all laughed and smiled as a family as we have read the books and looked at the beautiful pictures. Pirate Treasure! is a new story featuring Zoe and Beans as well as their neighbours, Oscar and his baby sister. Zoe and Beans, Pirate Treasure! is written and illustrated by Chloe Inkpen and her father, Mick Inkpen. The four characters are now (at least to us) instantly recognisable and it was great fun seeing them all in their swimming cossies for this beach adventure. The first time I read the story to the girls, they sat either side of me and the sofa, totally still, for the entire story. Stillness is unheard of in our house. In Pirate Treasure! Zoe and her friends are on a trip to the beach when one of them spots something shiny... treasure! This prompts a search which involves everyone and encompasses everything that can be found on the beach. There are lots of false starts but eventually Beans, being Beans does indeed locate the mystery treasure and everyone is happy. We have a beach holiday on the south coast planned for late July and it is great to get the girls in the mood with a summery themed book such as this. The pirate theme in this book will appeal to both girls and boys alike. Zoe and Beans story books are always quite short but they read so well. The words and pictures work together to build up the story and encourage your children to look at what is happening in the pictures. Size and space is used so well with large and tiny pictures used alongside one another to change focus of the story, or to speed the story up and slow it down. As a parent, I really enjoy reading Zoe and Beans books to my children because they flow well (and make me giggle). I would recommend Pirate Treasure! for children age 2-6.